We use a range of different PVC materials to suit individual needs, from a lightweight mesh banner to heavy duty 720gsm depending on the job. PVC banners are a cheap and effective way to promote your brand, event or venue. 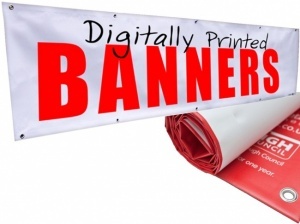 We supply all banners with hems and eyelets when required and can produce large sizes very quickly. Artwork to be supplied by customer.